Sometimes publishers make bold choices. The recent re-publication of Kevin Gilbert’s polemic from the 1970s, Because a White Man’ll Never Do It, is such a choice. Gilbert, a co-founder of the Aboriginal Tent Embassy in Canberra, wrote the book to spark debate and encourage political organisation in Aboriginal communities. That the work still stands as relevant today, and even as absolutely urgent, says a lot about what has and hasn’t happened since its original publication. A quick glance through some recent publications on the burning questions of self-determination and land rights reveals there is an absolute crisis in the mainstream debate. A prominent example is a new publication praising the big mining companies’ positive influence on Aboriginal communities, based on research funded by those same corporations. Most people would agree that a debate dominated by these sorts of ‘ideas’ is, to put it politely, not the best we can do. Gilbert’s work details some of the horrors of colonial violence and the ongoing legacy of colonialism. It’s also a portrait of an era: the rise of the Black Power movement in Australia, and Aboriginal activists’ involvement in a more fighting trade union movement, with all the victories, disappointments and complications these entailed. Gilbert paints a thrilling and vivid picture of these political meetings, rallies, speeches and fights. More than this, however, Gilbert’s polemic is a challenge: to Aboriginal communities on the questions of politics, leadership, organisation, unity and tactics, and to white people who dream that a paternalistic solution might ever be acceptable or successful. 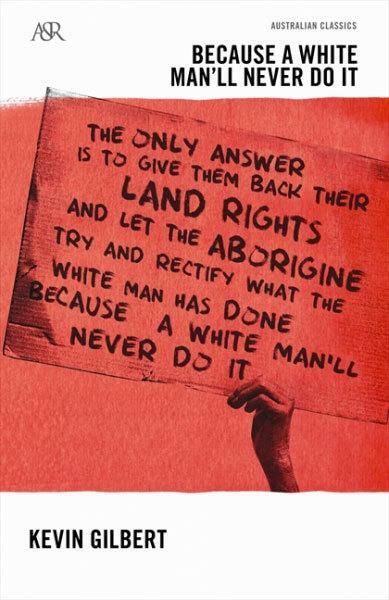 Gilbert’s call to arms reminds us that Aboriginal people won the most rights and gains not when big business stepped in, but when they were politically organised. Gilbert’s book is significant because it offers real ideas for change: Alexis Wright’s Grog War is the only other recent mainstream publication that comes to mind as daring to explore the possibility that big business might be no friend to Aboriginal people. Wright’s unusual book melds a journalistic style with fictionalised versions of real interviews, and tells the true story of the Tennant Creek community’s attempt to solve alcohol-related health problems, and the liquor industry and government’s crushing of this initiative. Wright commented to me recently that she thinks Gilbert’s work is hugely relevant today, in that ‘a great many Aboriginal people across the country have been reaching the understanding that what we have to do, we will have to do it ourselves, and are saying to each other, if you think you are a sovereign person, then act like it’. Before its re-publication I hadn’t read Gilbert’s book. The daily task of re-stocking the Australian Studies section at Readings was often a disheartening one. Putting Gilbert’s book on the shelf face out – a bright-red attack on apologists for the status quo – has changed this. That a book from 40 years ago retains its power and urgency is a rare and inspiring thing. You should check out the whole series of A&R Australian Classics, but I think you have to start with Because a White Man’ll Never Do It.